Heat butter in heavy medium saucepan over medium heat. Add chilies and cook for 2 to 3 minutes until fragrant. Add cheese and milk to saucepan; continue to cook, stirring constantly, until the cheese is melted and smooth. Add additional milk, as needed, until sauce reaches the desired consistency. 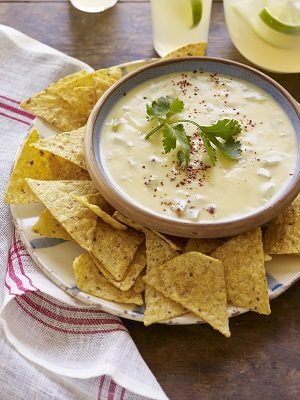 Serve immediately with tortilla chips or refrigerate and reheat over medium low heat as needed. Season with cilantro and chili flakes, as desired.